Fishing in Kona- Hawaii Sport Fishing- Charters on the Night Runner! What did the Night Runner catch today? Click here for daily catch report and photos! Contact us at 808 783-3646 or email Captin Shawn at nightrunnersportfishing@gmail.com! Five great reasons to fish with us. 1: We are one of the few owner operated charter fishing boats in the harbor. That means I take great care of my customers,boat and tackle as it is my lifes work. 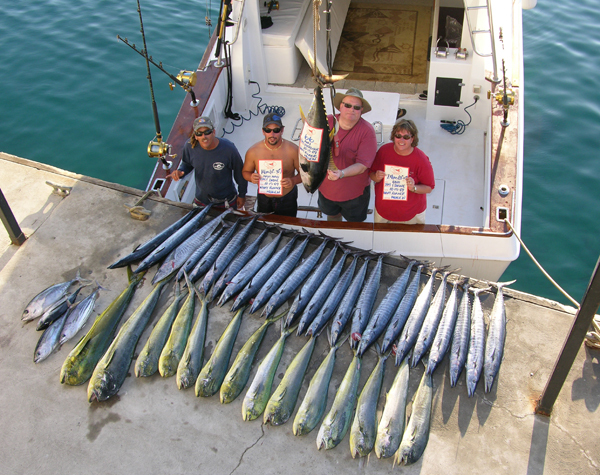 2: I am one of the only charter boats in Kona that is a world renowned big game lure maker. I have been hand crafting and testing Hawaiian style lures for quite a few years resulting in my knowledge of how and when to fish my lures. Marlin addicts all over the world are using lures I have crafted with great results. 3: We are family friendly. Kids are very much welcome and encouraged. I was born to fish and have been since I was just out of diapers. I personaly love to see kids get hooked on going fishing. Getting together on the water as a family is some of my best memories and I hope to make some of those memories for your family too. 4: The Night Runner is a beautiful 38 foot custom built sport fishing boat rebuilt from the ground up in 2006. Brand new motors and electrical system. She is clean, fast, comfortable, and very well maintained. We are 100% safe and coast guard liscensed. I use only the best tackle and keep all my rods and reels in perfect working order. If I am not fishing, I am doing daily maintainence and cleaning to ensure that every day on the water is the best it can be. 5: I let you keep your catch. 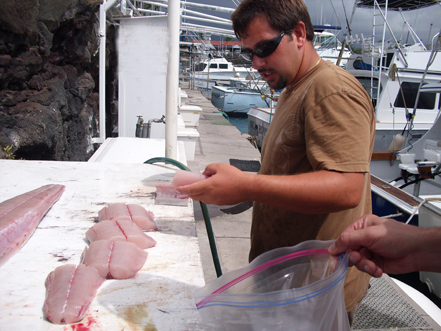 In Hawaii it is a common practice for the boat to keep and sell the catch of the day. I would be more than happy to filet any fish you may want and if you need can provide a wonderful restaraunt that will be happy to cook your fish if you can not. Best yet is I am always negotiable, so contact me and see what we can work out. I will try my hardest to fit your budget and vacation needs. 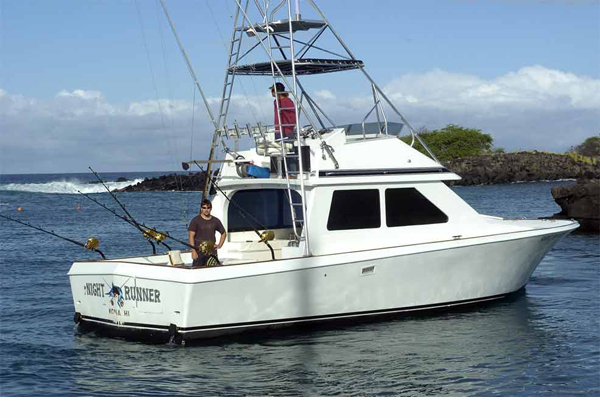 Night Runner Sport Fishing is located in Kailua-Kona on the Big island. Fishing in Kona is a wonderful way to spend the day and see the Island from a different angle. 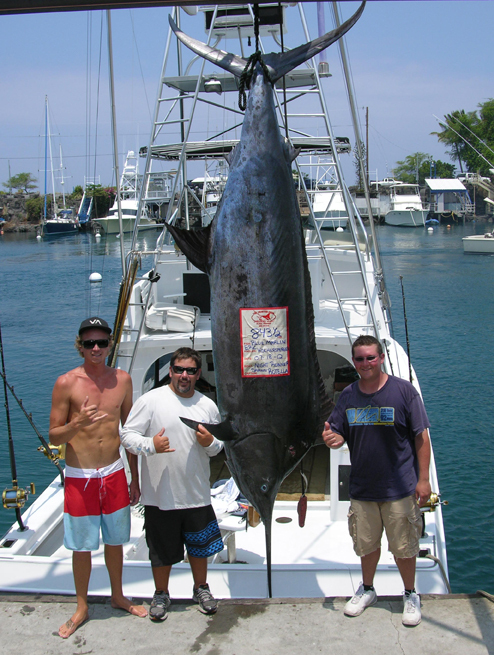 Kona is the big game fishing capitol of the world, and with beautiful calm waters here, anyone can enjoy a deep sea fishing experience. 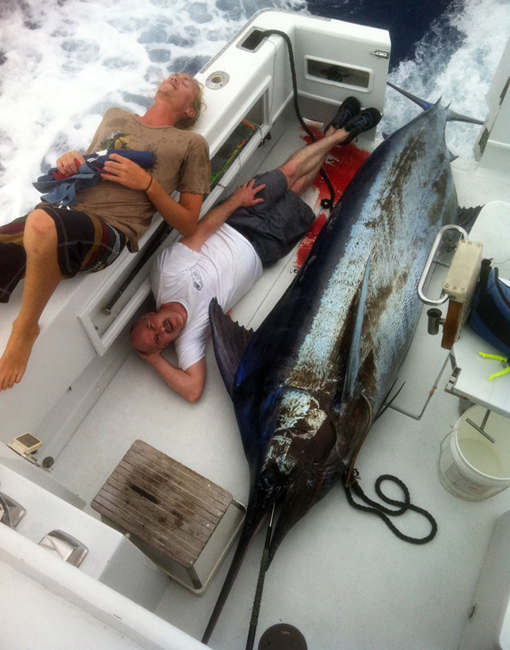 Giant Blue Marlin can be caught all year round as well as Mahi Mahi, Yellow fin Tuna, Wahoo, and numerous other species. We also do bottom fishing for Giant Trevally, Amberjack, Snapper, Shark, and a wide variety of other creatures of the deep.We offer so many options there is little excuse for not catching fish. We offer overnight fishing trips and custom combo trips if the gang feels like breaking up the day with a bit of snorkling on some of Kona's perfect reefs. We own and operate this charter boat so rest assured that you will get the attention you deserve as my reputation is always on the line. We take great pride in running a clean comfortable operation. 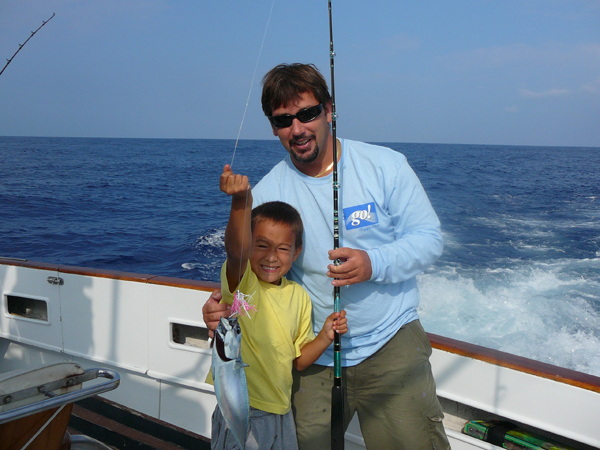 Kids are very welcome onboard and we love to see the excitment of youngsters pulling on a fish of their dreams. Please feel free to contact Shawn (808)783-3646 and He will answer all of your questions.Emails are welcome as well. you can email shawn at nightrunnersportfishing@gmail.com!